Sabina is a doctoral student at the Friedman School of Nutrition. She has worked in disaster response, public health emergencies, peacebuilding, and conservation. Her expertise is in engagement between crisis-affected populations and humanitarian organizations. Her work includes the earthquake and cholera response with IOM in Haiti, the Ebola response with IOM in Guinea, and community-driven peacebuilding efforts with Haitian organizations in gang-affected areas of Port au Prince. She is currently studying the ‘localization’ of humanitarian assistance. 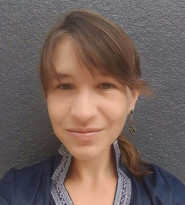 She has a master’s degree in food policy and applied nutrition from the Friedman School, a master’s in community change and applied peacebuilding from the Future Generations Graduate School, and a B.A. in community health and peace and justice studies from Tufts University. When not at Tufts, Sabina lives in Port au Prince, Haiti with her husband and step-daughter.